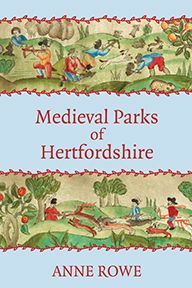 This book forms a continuation of the research published in Medieval Parks, Anne Rowe’s highly regarded volume of 2009. Now she turns her attention to the deer parks that existed in Hertfordshire during the sixteenth and early seventeenth centuries. 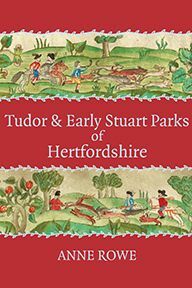 Drawing on the earliest county maps, most notably those produced by Saxton in 1577 and Norden in 1598, and both State papers and estate records, Anne Rowe builds a detailed picture of Hertfordshire’s Tudor and Early Stuart parks. At least 70 parks existed in Hertfordshire at various times between 1485 and 1642, but for only 46 of those parks is there evidence that they contained deer at some point during the period. These confirmed or probable deer parks form the focus of this study. Of course not all of them were sixteenth-century creations: less than one-third were ‘new’ parks, the remainder had been in existence for much longer, in one or two cases being recorded in Domesday Book. In the first part of the book detailed evidence for who created and owned the county’s parks and how they were used and managed is given. The dawning of design in Hertfordshire’s park landscapes is also explored. Part 2 gives an account of the presence of the Tudor and early Stuart monarchy in Hertfordshire. Several monarchs and members of their immediate families spent significant periods in Hertfordshire and played a notable part in the history of its parkland; indeed, by 1540 Henry VIII held about 70 per cent of the parkland in the county. 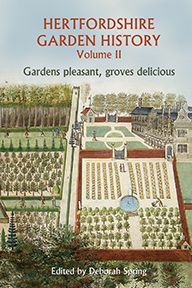 Part 3 is a gazetteer in which each entry brings together the documentary, cartographic and occasional field evidence available for a park, with a map showing its probable extent in the period covered. At this time hunting continued to be the most popular leisure activity, as it had been for centuries. Wealthy landowners enjoyed a range of hunting activities essentially unchanged from the medieval period, including deer- and hare-coursing on foot, falconry, fishing and wild-fowling. But the pursuit of a stag or buck on horseback accompanied by a pack of hounds was considered the noblest hunting experience. 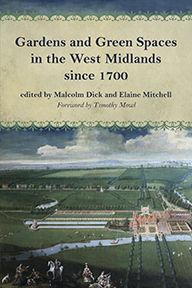 Based, like the first volume, on an enormous amount of original work, this meticulously researched book opens a window onto Tudor and early Stuart Hertfordshire and once again illuminates a significant aspect of the county’s landscape history.